At Natick Window Company, we understand that there are a lot of options when it comes to deciding what type of material you should choose for your installation and replacement windows. Vinyl windows are a great option, often chosen by many Massachusetts home and business owners. Whether you are looking for a stock vinyl window or have a more custom approach in mind, Natick Window Company is your expert source for all vinyl windows. ​Our technicians will make sure any window installation, window replacement, or even window repair service on your vinyl windows in Natick is simple and hassle-free! Vinyl will never need to be painted, and will not warp, chip, or peel. Windows made of this durable material will last for many years and will provide the optimum performance you are looking for. 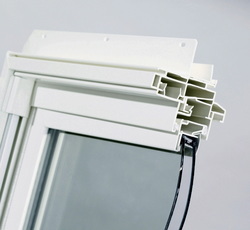 Modern, high-quality vinyl windows are welded together, rather than being held together by screws. This design improvement will ensure that your vinyl windows have a long life and provide the strength and durability you want in your windows. A great benefit that comes from installing vinyl windows is the lower resulting energy costs. Keeping harsh temperatures from infiltrating your home will help to drastically reduce your heating and cooling costs. Vinyl windows are a smart choice when considering the energy efficiency of various window materials. Vinyl windows are almost entirely maintenance-free. They will never need to be painted, stained, or scraped, and cleaning these windows is made simple by only requiring soap and water. Scratches to vinyl windows are a very minor concern, as they are incredibly durable and almost entirely resistant to scratches. If a scratch should occur, vinyl windows are the same color throughout, which means that any scratches to the surface of your windows will be virtually unnoticeable. Vinyl windows are an excellent option when considering cost effectiveness. Vinyl is the least expensive window material, but is also one of the most durable and highest in quality and long-lasting performance. There are many options when it comes to choosing a vinyl window. These windows are available in a variety of window styles, and can be chosen in a number of color and size options as well. Keep in mind, if you are looking for a custom vinyl window, some of the costs may be higher with customizing this particular window material. These are more difficult to shape, so across the window manufacturing industry, costs for custom vinyl windows generally tend to be higher than other window materials. Also, because vinyl windows cannot be painted, it is important to choose a color you know you will be happy with long-term. Natick Window Company has access to the top vinyl window manufacturers in the industry. ​ Call us today at 508-251-8038 to learn more about our extensive vinyl window product offerings and services! Our staff members are standing by to provide you with a quote, and set up your in-home consultation today!